Alerting Reliability: the ability to be relied on or depended on, as for accuracy, honesty, or achievement. In IT, alerting reliability is the key to up time. Enterprise Alert helps increase reliability by getting you the alerts you need, when you need them, to the people that need them, and allows you to neutralize the problem from your smart device. Looking back, Dave should have called sooner. Faced with presenting his company’s website to potential customers, Dave would start his presentation with trepidation. Excited about the chance to show off his company’s great new product, he couldn’t be sure the site would cooperate with his plans. Going through slides, showing off the key features that will enhance his customers‘ training experience, he was filled with elation. Then it came time to demo the site. Switching from his slide presentation to his web browser, he loads the site and holds his breath. But this could have been avoided if Dave had been notified of an issue with his server sooner. Facing the customer isn’t the time to find out that you have a alerting reliability issue because a critical alert that needed to be tended to wasn‘t. With Enterprise Alert, you can quickly and easily be notified of alerts on your critical web servers and respond to issues anywhere, any time, bringing them back online with the push of a button on your smart device, increasing the alerting reliability of your server. You have the systems in place to monitor your network, but in order for it to be 100% reliable, it needs to be manned 100% of the time or you need to depend on inefficient alerting through channels that might not alert the right people. With Enterprise Alert you can step away from the terminal to help your internal and external customers, or be on call 24/7 where ever you wish. Head to the bar for that big game or take your wife out to eat. 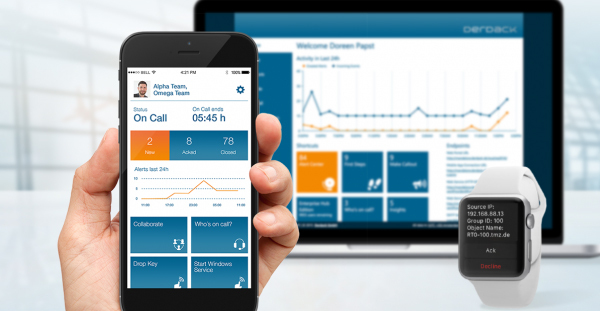 Enterprise Alert will have you covered with it’s on call scheduling features, allowing you to target the individuals on call with the alerts that matter, getting the right information to the right people at the right time. And ensuring that you maintain the alerting reliability that you seek. It also allows you to collaborate with co-workers via Enterprise Alert’s App. Quickly and easily start a telecon, text, email, or chat session from your smart device so you can talk the problem over with co-workers or let your boss know that your server is down before he starts his presentation. Don’t be faced with a humiliating 404 error in front of your customers. So when will you make the call? To learn more about how Enterprise Alert can effect your 24/7 IT Operations, visit us here. To request a 14-day free trial of the software, visit us here.